Its SEER rating measures the effectiveness of any air conditioner. The SEER of the AC is the measure of its cooling efficiency. The higher the SEER rating, the more efficient a unit is. Heil offers air conditioners of up to 19. The Heil Quiet Comfort DXT+ Observer Air series of AC is an example that has an energy rating of 19 SEER. These are the top best air conditioners from Heil. They offer high efficiency and save utility bills by huge margins. Heil air conditioners are equipped with Observer communicating technology. This type of technology enables the components of the system to coordinate their processes properly. As a result, efficiency is maximized as well as the overall durability of the unit. This technology is beyond standard thermostats, the technology by design adjusts for best performance as well as efficiency. It also gives a signal during maintenance time and or when filters need changing. The size of an air conditioner is measured by the tonnage of the unit. As the load increases so do the size of the AC. Heil air conditioners have a broad range of capacity ranging from one to five ton. The higher the capacity of a unit, the higher the price as well as the efficiency. To know the right size for your home a Heil contractor must do a load calculation to determine the proper sizing. This is a two-stage series of ACs that offer excellent efficiency. This model is among Heil’s top-selling high efficient models that are most suitable for warm weather conditions, areas where extreme temperatures are rather rare. It is prudent to pair the two-stage cooling of this unit with a variable speed blower to achieve maximum comfort. Heil air conditioners are durable because most of them are made of galvanized steel. Heil offers air conditioner unit for any price range that one can manage to pay for. The company has manufactured rather cheap yet unfailing solutions for all their customers. This is convenient especially for consumers who desire comfort but their budget and purchasing power is a bit low. Also the warranty terms of Heil are reasonable and much favorable as compared to warranties from other brands in the market. This is helpful especially to consumers buying the top notch Heil’s air conditioners. Heil is not that famous in the heating and cooling market. People know Trane, Carrier, Goodman but seldom talking about Heil, Ruud and Armstrong which actually are all trusted brands. Heil rarely do any marketing promotion and that’s why the Heil’s price is lower. If you can choose a good contractor to do a qualified installation, it can runs normally for 10-20 years. Finding a trusted installation contractor with rarely promoted brands is always a good choice. Each model includes: 2.5 ton outdoor condenser, 1300-1400 CFM air handler, programmable air conditioner thermostat. Before installing your air conditioner, an HVAC contractor needs to size your system by “Manual J” calculation. This will take into accounts factors like where you live, how much insulation you have, windows types and directions, and everything else. Then you will get a right sized central air conditioner ranging from 1.5-ton to 5-ton. Each Unit includes: Heil 2.5-ton outdoor condenser, Trane 1300-1400 CFM air handler, programmable thermostat. Complete system was delivered and installed in about 6 hours and does a good job of controlling our home climate. Can’t provide efficiently related to our energy cost because it was only installed to replace our old 24 year old worn out builders grade system this past weekend. I like Heil air conditioners because you don’t have to worry about anything if it is installed right. The one I have now runs so noiselessly and I like the fact that the utility bill stays low. Thank you Heil the ac is just what I thought it would be. When I moved in to this new house one of the first things I changed was the air conditioning. The I found here was not working right so the cooling couldn’t go below 770. Now I have Heil and everything is working perfect. It’s been 7 months since I got it and so far am pleased with its functionality. It hasn’t given me any headaches. I read reviews about the air conditioner breaking down or malfunctioning in some way after 3 months. I guess I got a sweet deal from Heil. 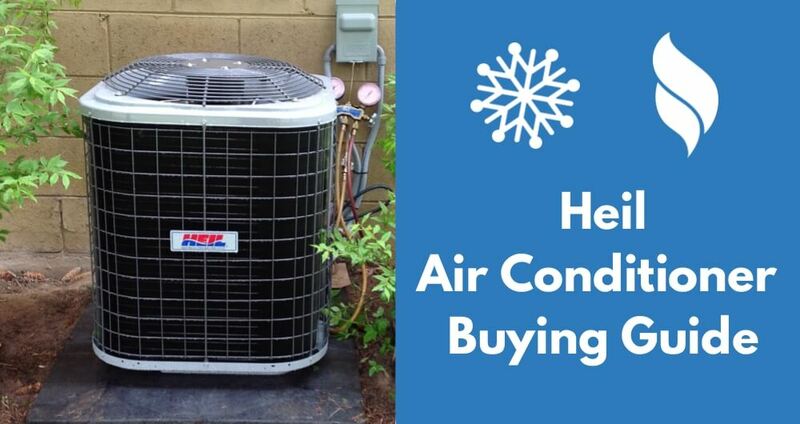 Anyone who wants a new air conditioner installed in their home should check out what they can get from Heil. I can assure you that you will like what you get. I have had my current ac system for a year and a half and I’ve only called the repair guy once and the problem was due to poor installation. Heil is a brand I stand behind because their customer service is great, they deal with customer queries fast. It took under a week to come and fix my problem and I haven’t had any complains since then. The value of a good ac system is not in the price it’s in the performance. When I was looking for a replacement for my old Trane I looked through the internet to see what people were saying about the models out there. Heil came highly recommended and so I did a little more research so I could make an informed choice. So far the purchase has proved to be worth it. Our old system couldn’t cool the house efficiently after years of service so I had to replace it. Heil has provided me with something that does a better job at cooling, am looking forward to the next summer. The ac has a problem; it’s probably poor installation because I bought the unit 5 months ago surely it still has some years left in it. It functioned well for the first 2 or so months and then it just couldn’t cool the house below 720. It’s hot and the air coming through my vents is not helping much to make the place cooler. I hope the company or the dealer can do something about this because it is covered by the warranty. Don’t bother buying these air conditioners, get anything else but Heil. I bought the unit I have about 2 years ago and since then it has cost me well over $1,000 to fix. The coil is the most recent part I have had to fix. Poor design. How to Get the Best Heil Air Conditioner Prices? I have a heil unit AIR conditioner that was installed around 2009-2011. I’ve had problems with it leaking Freon, coils freezing and water dripping onto my carpet. Does this whole unit need to be replaced? Is it under a recall? How long is my warranty? I have a Heil air conditioner. The GE motor 1/5 HP quit working. Service Experts in Raleigh N.C. has charged me $99.00 to diagnose the problem. Now they are planning to order a oem condenser motor and charge me $608.00. Also he plans to change the capacitor run and charge $147.00. I feel like these charges are high. I would think a motor would cost under $200 and a capacitor under $20. What is your opinion? I just got six estimates from a local AC contractor (Orlando, FL area): three for Trane and three for Heil. Complete system install including outside condensor unit, inside air handler, new refrigerant lines, and some relocation of the lines. Trane: 18 seer = $10,800; 16 seer = $6710; 14 seer $5813. Heil: 16 seer (2 stage compressor) = $7494; 16 seer (single stage compressor) = $5463; 14 seer = $4780. Contractor seems decent and well-established. I’m probably going to go low dollar. Plan on selling this house in six years. Had my Heil central unit since 2001. It’s very good and has given me no problem. We have had our Heil unit 30 years, and it is finally time to replace it. We have had to make very few repairs that were low cost over this time period. We will be purchasing another Heil to replace this unit. I need the footprint dimensions of a Slimline AC & Coil Only -4 ton 14 SEER Single Stage.